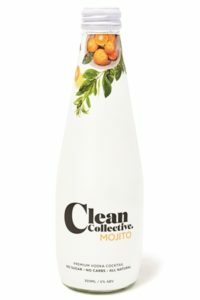 Pure alcohol might sound somewhat lethal but not when it comes to Clean Collective’s range of RTDs which have muscled their way onto the market. 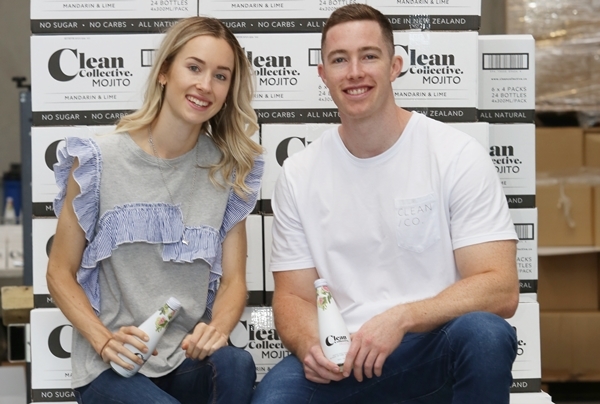 With loads of Kiwis keen to clean up their drinking act, Dan Benoy and Holly McGrath could well have the product to refine their thinking – a range of all natural pre-mixes with no sugar and no carbs. Like most young people who hit the legal drinking age, the pair spent a lot of time socialising in their late teens, early 20s – “the norm was to take your own refreshments (at that age it was mostly pre-mixes) rather than rocking up with a whole bottle of vodka,” Holly says. But, four years down the track she and Dan were more nutritionally aware of what went into their drinks and, disillusioned by the number of sugar-laden RTDs on the market, they started looking for healthier options. “I guess I shouldn’t have been surprised that everything in our local liquor stores seemed to be loaded with sugar or artificial crap,” Holly says. “What’s more, there was no requirement for alcoholic drinks to show a printed nutritional panel. We thought that was crazy when most other food products have to show one. We knew there had to be a better way. With their search for alternatives stalled, the couple decided to take a leap of faith – they had been saving for the Big OE but the idea of producing their own all natural, alcoholic RTDs without the sugar or the carbs, took hold. “We had $30,000 for the start up. Although we both had a background in sales and marketing, and we were also equipped with a strong passion for health, we had no experience in the alcohol beverage industry,” Dan says. Despite being rank amateurs, this enterprising Auckland pair decided to “go for it.” They listened and learned then engaged a food technician who had eight years beverage experience in the United Kingdom particularly with low carb drinks. After a year of painstakingly doing the groundwork including knocking on plenty of industry doors, Dan and Holly officially launched Clean Collective in December last year. “We just hoped people would give our product – and us – a shot,” says Holly. “As you can imagine, there were a lot of ups and downs just getting to that stage. We had to find the right companies to bottle, label and distribute our product and we, personally, went to liquor outlets asking them to take a punt. But not without some hiccups! “The first month we sold out completely. Being close to Christmas we couldn’t immediately supply repeat orders; it was terrible, we didn’t want to lose customers before we had really even started. We knew the one thing that had to be right was our ability to supply at any given time,” Holly says. “We definitely felt the pressure of our mistakes, and of the competition especially me I tend to panic more when things go wrong, Dan is more measured. That’s probably why working together works for us. “We have similar but different skill sets and our temperaments while different tend to complement each other – that’s not to say we don’t have our moments,” she laughs. But that hasn’t meant resting on their mojito! A second flavour – watermelon, cucumber and lime – has been Clean Collective’s biggest seller although Dan and Holly hope the new Gin & Tonic with a twist will be another winner. “Interestingly, we thought the 100% natural, no sugar, no carbs ethos would appeal to our age group and younger but it’s been the 30s, 40s and 50s who have really taken to them as well as people on the likes of the Keto diet or who have diabetes,” says Dan. In fact, prior to Christmas the pair says it was a whirlwind keeping up with demand. “Well, we want to keep developing the range and establish Clean Collective firmly throughout New Zealand then we’ll look at exporting to Australia,” Dan says. But Holly has her sights set even higher – “Maybe, we’ll do a 42 Below one day and sell the company for millions,” she laughs. And, as a Clean Collective convert, I’ll drink to that!